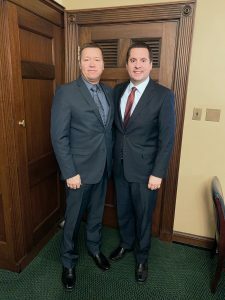 During the last week of January, PORAC Vice President Damon Kurtz visited Capitol Hill for a busy day of meetings with members of Congress and their staff. Mr. Kurtz met with representatives from nearly a dozen congressional offices and met directly with five members of Congress. Vice President Kurtz’s visits served several purposes. It enabled him to introduce himself as PORAC’s new vice president. He was able to lay out PORAC’s legislative priorities for the year: law enforcement funding, criminal justice reform and pension and labor reform. He shared PORAC’s new engagement initiative, the federal legislative scorecard, which PORAC debuted to association members during the November Annual Conference. The legislative scorecard will track a member’s legislative actions on PORAC’s priority bills, as well as his or her engagement with the association both in Washington, D.C. and in the member’s California district. The members with whom Kurtz met applauded PORAC for creating the scorecard and agreed that it could be an effective tool to increase the association’s visibility on Capitol Hill. A number also expressed interest in contributing independent op-eds to PORAC’s monthly magazine, so look out for them here in the coming months! 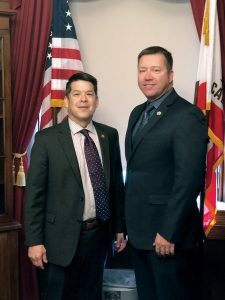 We look forward to continuing these discussions with those members, as well as with the rest of the California representatives before, during and after PORAC’s Board of Directors fly-in, scheduled for late March. On February 14, the Senate approved 54–45 on a mostly party-line vote the nomination of William Barr for U.S. Attorney General. Three Democrats, Senators Doug Jones (Alabama), Joe Manchin (West Virginia) and Kyrsten Sinema (Arizona), voted with Republicans in support of Barr. Republican Senator Rand Paul (Kentucky) was the sole Republican to oppose Barr. Among the primary issues that AG Barr will have to address immediately is how to handle Special Counsel Robert Mueller’s investigation into Russia’s efforts to interfere in the 2016 presidential election. As a public citizen, Barr was an outspoken critic of the investigation, but during his confirmation hearings earlier this year, Barr told senators on the Senate Judiciary Committee that he would not obstruct the investigation. Currently, Deputy Attorney General Rod Rosenstein is leading the investigation but is expected to announce his resignation in the coming weeks. AG Barr likely will reprioritize existing DOJ initiatives to better align with his own policy priorities and positions. Although Barr, like former Attorney General Jeff Sessions, is a hard-liner on immigration and is historically tough on crime, Barr expressed a willingness during his confirmation hearings to loosen his stance on criminal justice. He assured senators on the Judiciary Committee that he would implement the new criminal justice reform law, the First Step Act, as written. Barr also told senators that the DOJ would work with state and local law enforcement on issues such as gang violence, human trafficking and immigration. Barr additionally distanced himself from Sessions’ tough position on marijuana, telling senators that he would not target marijuana companies in states that have legalized the drug. AG Barr begins his tenure at the DOJ immediately. On January 31, Representative Rodney Davis (R–Illinois) reintroduced the Social Security Fairness Act of 2019 (H.R. 141). The bill would repeal two provisions of the Social Security Act: the Government Pension Offset (GPO) and the Windfall Elimination Provisions (WEP) that penalize workers who split their career between jobs that contribute to Social Security and jobs that do not (usually state or local jobs like law enforcement). The GPO and the WEP slash the Social Security benefits that PORAC members are entitled to by two-thirds. The WEP reduces Social Security benefits for workers that receive a public pension from their previous job (where they did not contribute to Social Security), disadvantaging public safety officers who retire and then take a position in the private sector. And, under the GPO, if a law enforcement officer’s spouse dies and that spouse had contributed to Social Security, then the law enforcement officer would not receive half of the spouse’s Social Security benefits like most other Americans would. Instead, the public safety officer’s benefits he or she would have received from his or her spouse would be offset by two-thirds of the officer’s public pension, thereby eliminating most or all of the Social Security benefits that the officer should have received. PORAC has endorsed multiple versions of H.R. 141 in the past and will continue to support legislation that would preserve Social Security benefits in retirement, as well as other bills that would fix the public pension system. In a 5-4 decision, the U.S. Supreme Court ruled that a robbery conducted with force sufficient to overcome a victim’s resistance constitutes “physical force,” satisfying the requirement of a violent felony under the federal Armed Career Criminal Act. The act requires a mandatory 15-year sentence for those convicted of firearm possession if they previously had been found guilty of three violent felonies or serious drug charges — a sort of three-strikes policy. In Stokeling v. United States, Denard Stokeling was arrested for burglary in 2015 after being caught on camera and identified by several witnesses. When Mr. Stokeling was arrested, police officers found a gun in his backpack. Mr. Stokeling had three felonies in 1997 on his record, possibly triggering the Armed Career Criminal Act and its mandatory 15-year sentence. Mr. Stokeling’s lawyers argued to the court that one of the felonies, an unarmed robbery in Florida, should not be considered a violent felony under federal law. The majority of the justices disagreed: under Florida law (which considers a felony to be violent if the victim resists), the unarmed robbery was a violent felony, and, therefore, could be considered as one too under federal law. The majority opinion was issued by Justice Thomas, who was joined by Justices Alito, Gorsuch, Kavanaugh and — surprisingly — Breyer, who usually votes with the court’s liberal wing. Justice Sotomayor penned the dissenting opinion, arguing that the standard offered by the majority meant that, depending on a state’s definition of what level of force constitutes a violent crime, crimes with little to no force at all could be defined as violent felonies under federal law. Chief Justice Roberts and Justices Ginsburg and Kagan joined Justice Sotomayor in her dissent. On November 6, 383 Congress members and 35 senators fought to win their respective reelection bids. To secure a majority in the House, a party must win 218 of 435 seats. In the Senate, because the vice president can break a tie vote, the party of the president has to win only 50 of 100 seats, while the other party must win 51 seats to obtain a majority. In the House, Democrats successfully upended Republican control, reaching 225 seats, with nine key races still undecided at the time this issue went to print. In the Senate, Republicans maintained their majority, increasing the number of seats they hold by “flipping” two former Democratic senators’ seats (Senators Claire McCaskill (Missouri) and Joe Donnelly (Indiana). While the Democrats did pick up Republican Senate seats held by Senator Dean Heller in Nevada and retiring Senator Jeff Flake in Arizona, Republicans flipped two Democratic Senate seats. As of this printing, two Senate races remain undecided. Incumbent Senator Bill Nelson (D-Florida) trails current Florida Governor Rick Scott in a race that’s too close to call, while the two candidates vying for a Mississippi special election seat were both unsuccessful in securing the mandatory 50% needed to avoid a runoff election; they will face each other again on November 27. Despite the number of races yet to be called, the split in party control will result in a divided government until the next elections in 2020. Despite this, law enforcement issues will likely continue to receive significant attention. Below we have analyzed the outcomes of the midterms in California and, more broadly, how the change in House leadership and restructuring in the Senate will impact law enforcement issues. During the midterm elections, the 51 members of Congress from California as well as the state’s senior senator, Dianne Feinstein (D), battled challengers to continue representing California constituencies on Capitol Hill. Of the 51 members who ran for reelection, 47 incumbents and Senator Feinstein won their races. As of November 16, one race in California was still too close to call — the race to replace retiring Representative Ed Royce (R-39). Democratic candidate Gil Cisneros has a slight lead over Republican candidate Young Kim. Although she had not conceded at the time of this publication, Representative Mimi Walters (R-45) was projected to lose to Democratic opponent, Katie Porter. Representative-Elect Porter has not advocated strongly in favor of or against most law enforcement issues. She has identified herself as a progressive Democrat in favor of “common-sense gun reform,” including mandatory background checks and a ban on assault weapons. Representative Steve Knight (R-25) conceded to his Democratic opponent, Katie Hill. Democrats also picked up an additional California seat, the seat in the 49th Congressional District currently belonging to Darrell Issa (R), who announced that he is retiring at the end of the year. Because a large majority of Californians voted via mail-in ballot, the final state and federal races could take weeks to determine. Steve Knight and Katie Hill: Of the 27 races that PORAC endorsed, 25 members won, with Representative Steve Knight being the sole member endorsed to lose his race. Since Knight has been in Congress, PORAC has been closely engaged with him on law enforcement issues. This past year, PORAC collaborated with Knight to craft a bill to strengthen school safety, the “School Training, Equipment, and Protection Act of 2018” (H.R. 5307), and advocated for the bill while on Capitol Hill during the Association’s May fly-in. We anticipate that Representative-Elect Katie Hill, however, will be friendly on law enforcement issues. Hill, the daughter of a police officer, ran on a platform of safety and security, stating that Congress should “prioritize the needs of our peace officers so that they can protect our communities,” emphasizing a tough but smart immigration policy. Because Hill is a first-time politician, we cannot confirm how she will vote on law enforcement issues, but we will be monitoring her decisions throughout the 116th Congress. Speaker of the House: Current House Minority Leader Nancy Pelosi (D-12) will run for Speaker of the House, the most powerful position in the House of Representatives. Although newly elected progressives and some incumbent members of Congress have voiced strong opposition against Pelosi, she is expected to run uncontested. Elections for Speaker of the House will take place after the Thanksgiving holiday. PORAC will continue to engage with Pelosi on law enforcement matters during visits to Washington, D.C., in 2019. The change in party leadership will result in a “priority shift” for the many committees and for the chamber as a whole. Probable incoming House Judiciary Committee Chairman Jerrold Nadler (D-New York) has already stated that he will increase oversight of the Trump administration, particularly with the president’s recent decision to replace Department of Justice (DOJ) Attorney General Jeff Sessions with Sessions’ chief of staff, now-Acting Attorney General Matthew Whitaker. Apart from government oversight, Democrats will presumably try to address gun control reform — forcing Republicans to vote on the issue. Because Democrats tend to favor government spending, it is likely that there will be increased funding for grant programs, including DOJ grants on which law enforcement relies. 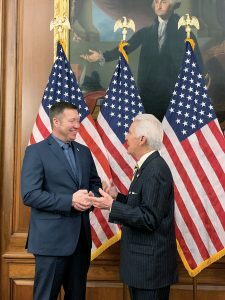 PORAC will work with the new members of Congress as well as incumbent members to ensure that grant funding for law enforcement is maintained and expanded. Although there are partisan issues on the agenda, Democrats are also likely to take up a more bipartisan matter: criminal justice reform. A criminal justice reform bill that passed the House in May was considered by Democrats and some Republicans to be too narrow in its reform agenda; namely the bill addressed only prison reform and did not address sentencing reform. It is possible that House Democrats will work with Senate Republicans and Democrats to pass a broader piece of legislation that also includes sentencing reform. Congress has been working with the White House to introduce a bill that includes sentencing reform to be taken up this Congress. Senate Majority Leader Mitch McConnell has stated that he will bring the bill to the floor if he is assured he has 60 votes from senators, meeting the minimum number to guarantee passage. Given the short time left in this year’s legislative calendar for Congress to complete its list of desired tasks, however, the framework of the current bill or a similar version will most likely be broadened and reintroduced next year under Democratic leadership in the House. Before the 115th session ends, Congress is working to pass appropriations bills required to fund the government (to avoid a government shutdown) and sign reauthorization legislation into law. One of the reauthorization bills, the Violence Against Women Act (VAWA) provides essential funding to law enforcement to combat violent crimes against women. PORAC has actively advocated for VAWA’s reauthorization and, in September, VAWA was provided a short extension, but VAWA currently expires on December 7. In the event that the reauthorization is pushed until the next congressional session, Democrats are likely to demand more funding for VAWA and ensure that the Act is reauthorized for several years. We are also optimistic about new opportunities for pension reform in the upcoming Congress. The likely incoming House Ways and Means Committee Chairman — the Committee that has primary authority over pension reform — Representative Richie Neal (D-Massachusetts) has championed retirement savings and pension reform issues in the current Congress. While the Senate remains in Republican hands, there will likely be shifts in the Senate Judiciary Committees’ Republican leadership. By the Thanksgiving holiday, current Committee chairman, Chuck Grassley (R-Iowa), is expected to announce whether he will seek to hold the gavel for the Senate Finance Committee, abdicating his current chairmanship. In the event that Senator Grassley chooses to lead the Senate Finance Committee, under seniority rules, Senator Lindsey Graham (R-South Carolina) is likely to become Senate Judiciary Committee chairman. At the time of this publication, Senator Grassley had not made a decision on which chairmanship to yield. Under a Chairman Graham, the Senate Judiciary Committee will likely undergo some immediate changes. For example, Senator Graham has publicly announced that he will dispose of the current “blue-slip” process, which allows senators from the minority party to provide a favorable or unfavorable opinion on federal circuit court nominees in their state. Senator Graham also stated that the Committee would be “full throttle” when it comes to confirming judges. Despite all, however, Senator Feinstein is expected to remain ranking member. PORAC looks forward to continuing its work with the Senate.